With Hep C treatment a key determinant of treatment outcome is liver fibrosis. Less is definitely more. F4: cirrhosis or advanced scarring. In the studies patients are divided into 2 groups - have cirrhosis, don't have cirrhosis. This is actually not realistic because you start with no fibrosis, get more and more fibrosis along the way and end up with cirrhosis. Most HCV patients, if untreated, are expected to develop cirrhosis at about 65 years, irrespective of the age at infection. Thus, age itself seems even more important than age at infection for predicting the occurrence of liver cirrhosis. If you have cirrhosis or even perhaps are simply very close to having it consideration needs to be given to extending treatment from 12->24 weeks and adding Ribavirin. A hepascore value ≥ 0.50 indicates significant liver fibrosis , whereas if the result is < 0.50 significant fibrosis is absent. Ya, that's exactly the chart my doctor here in Bangkok showed me. 12 weeks and no Ribavirin ..... YAY! My AST/ALT score is F1 and my APRI score is F4? "Conclusion Conclusions The AST/ALT ratio had the greatest diagnostic accuracy in determining significant fibrosis or cirrhosis. The Kings score performed better than APRI. AST/ALT is a simple guide to determine significant fibrosis and cirrhosis in liver disease." While I appreciate that any F score above 0 means some scaring, why the difference? Note: This posting in no way supports or promotes the procurement of, or even the mention of, generic products, brand substitution, or even talking to a pharmacist or doctor about medications that one is to take. If anyone reading this post suspects that this posting has directly, or indirectly, led the reader to contemplate generic medications, or thinking for themselves, then they should report this post to the TGA - attention: ‘The Boofhead in charge of wasting tax payer’s money for no good reason’. Had the amazing new LiverMultiScan and I was overall F1 with small 'spots' of higher fibrosis in the center & left lobe area (F3/4?) , but not joining up, just small spots. However, instinct tells me small spots can cause some problems, they seem to be where there are other organs eg heart and a lot going on in that area, maybe easier for the virus to hide in? and harder for the meds to reach possibly? Again, just my instinct. I can see why exercise is helpful, looking at my LIF scan. One thing I really learned after this new scan, is fibrosis is not necessarily evenly spread. Last Edit: 2 years 10 months ago by LondonGirl. wish I had that scan thingo here 18 years ago - they stabbed me five times during a liver biopsy! 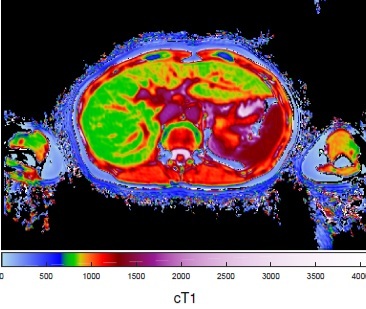 I am also a bit worried about ongoing scans (for HCC) that may involve contrast dyes. Necessary, but I often worry about having too much of a good thing. did you get around to making a T shirt with the scan on it?? Hey Jeff, The great thing about the new LiverMultiScan is it doesn't need contrast dye at all, they have taken this into account. Now FDA approved for the USA. Hi London Girl - that is an amazing MRI imaging. It looks so much more accurate than Fibroscan as it can check all areas of the liver. My lay assumption is that even if scored F1 (my case) on Fibroscan or conventional Ultra-sound, we might be missing those red (bad) spots where it is more difficult for the DAAs to reach. Cool pants by the way. Was going to ask you to make some for me, but mine are in crummy black and white. But maybe you could photoshop out the scarring so I don't worry as much; or for some of our friends who have livers not bad enough for treatment to be covered, add some marks here and there?